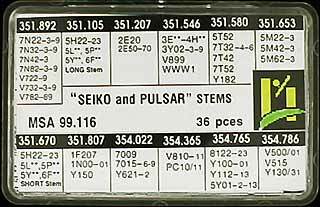 Stems for over 40 popular Seiko and Pulsar calibers. 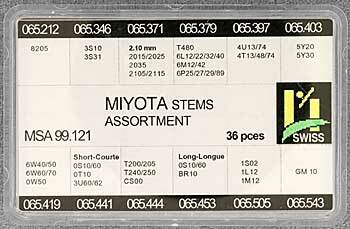 Stems for over 25 popular Miyota calibers. Swiss made, 10 pieces each of 12 different sizes. 10 different sizes, 3 pieces each size, a total of 30 pieces. Swiss Made. Stainless steel case tube/crown tube18 different sizes, the smallest has case tube diameter of 1.40 mm with crown tube shoulder diameter of 1.50 mm. 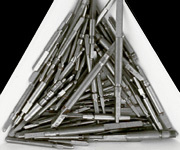 The largest size in the assortment is 2.20 mm diameter at the case tube end and 2.50 mm diameter at the crown tube end. The assortment contains 5 pieces each of the 18 different sizes for a total of 90 pieces. 10 pieces each of 9 different sizes. A total of 90 stem extenders. 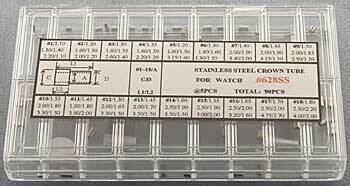 Assortment of 120 Stem Extenders supplied in plastic box with each size in it own Plastic Tube with Cap. 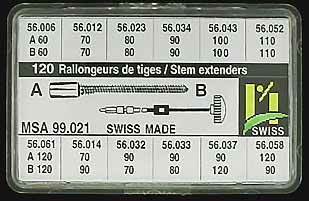 These are Swiss made extenders, containing 10 pieces each in 12 different stem sizes, which allow you to either extend the length of your old stem or to convert the old stem to a different (Tap) stem size crown. 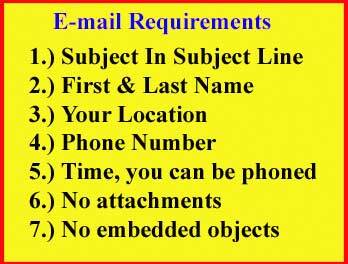 Refills are available on request at any time. 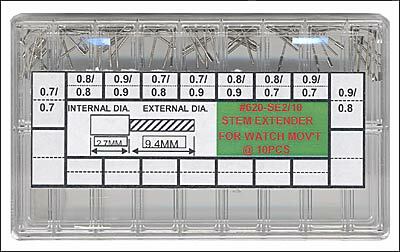 Assortment of 60 Stem Extenders supplied in plastic box with each size in it own Plastic Tube with Cap. 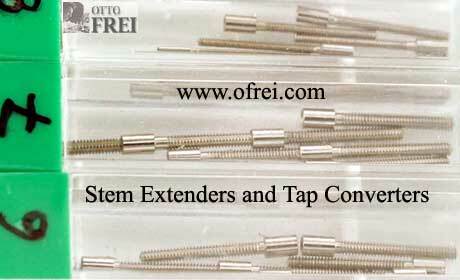 These are Swiss made extenders, containing 5 pieces each in 12 different stem sizes, which allow you to either extend the length of your old stem or to convert the old stem to a different (Tap) stem size crown. Refills are available on request at any time. 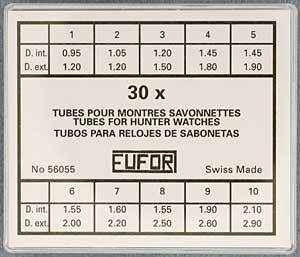 100 assorted tube pieces for Hunter Watches. Swiss Made. 25 assorted tube pieces for Hunter Watches. Swiss Made. 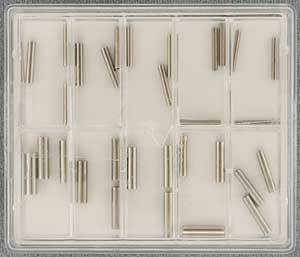 72 Swiss made Pocket Watch Stems from Vigor. 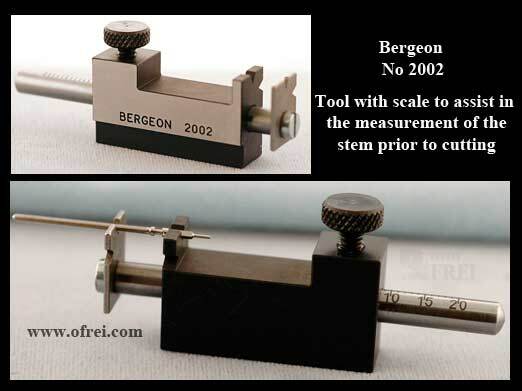 Tool used to help measure the correct spot of where to cut, when shortening a stem. 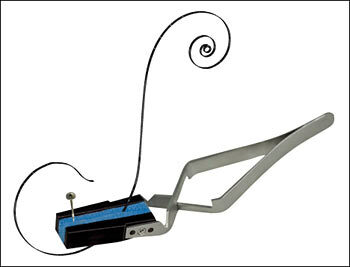 Anti-magnetic, anti-acid, stainless steel tweezers with soakable foam tips used to lubricate the mainspring and stem.